The field of contact dermatitis is potentially frustrating given the complexity of the clinical decision-making process and the effect of false positives and negatives on patient expectations and management. 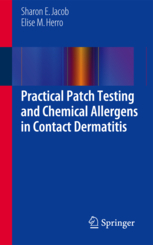 Practical Patch Testing and Chemical Allergens in Contact Dermatitis outlines the most common allergens with practical tips for patch testing in a concise and algorithmic fashion. Children have different needs for patch testing and this handbook describes how to test them safely and manage their disease. Educating patients on how to avoid their irritants and allergens is also key to treatment in all types of contact dermatitis. The authors have incorporated concise reference material on where these chemicals are found and how patients can avoid them. Clinical pearls for patch testing of certain allergens are clearly outlined in this handbook to help providers avoid common pitfalls and reduce the risk of incorrect diagnoses. A frustrating clinical visit and a disappointed patient can potentially be avoided with the use of this book, and thus is is an essential reference for trainees in dermatology and all involved in the management of patients with dermatitis.